We can hardly believe it is already time. 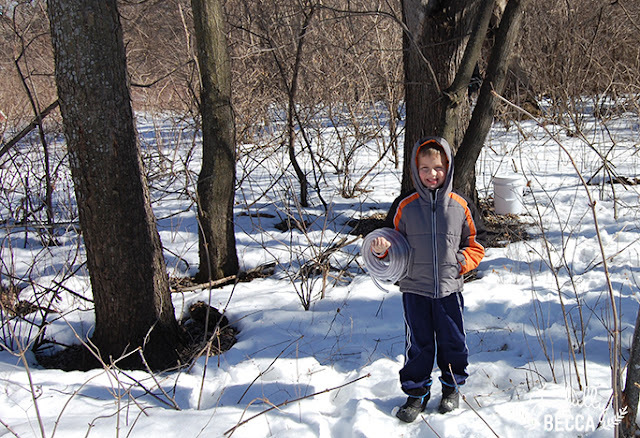 The past two years we haven’t tapped our maple trees until mid March, but here we are, end of February and the sap is flowing. Rory is trying something new this year, using tubes and five gallon buckets. 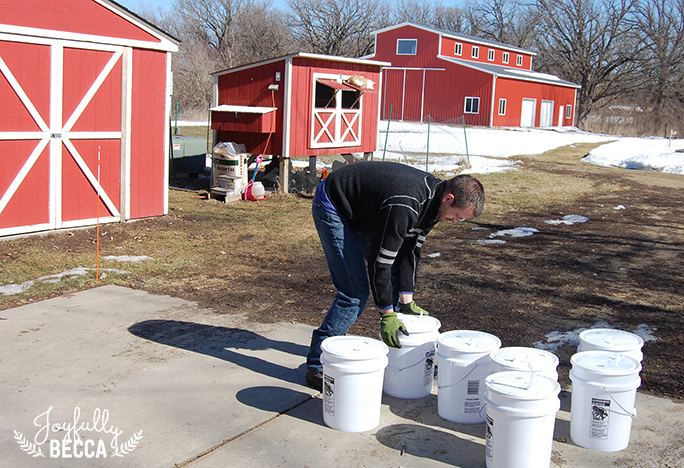 He’s excited not to have to empty the bags each day and pour them into the buckets. In theory, he should be able to simply replace the bucket when it gets almost full with an empty bucket. Ivar is quite the helper and stuck with his dad the whole time, even though it was very windy and chilly. Hattie and I were out for about as long as it took to take this picture. She was not a fan, even though she was adorable in her little peek-a-roo. Elsie lasted a bit longer but came in the house crying that she was cold and wanted to read books on the couch with me and Hattie. 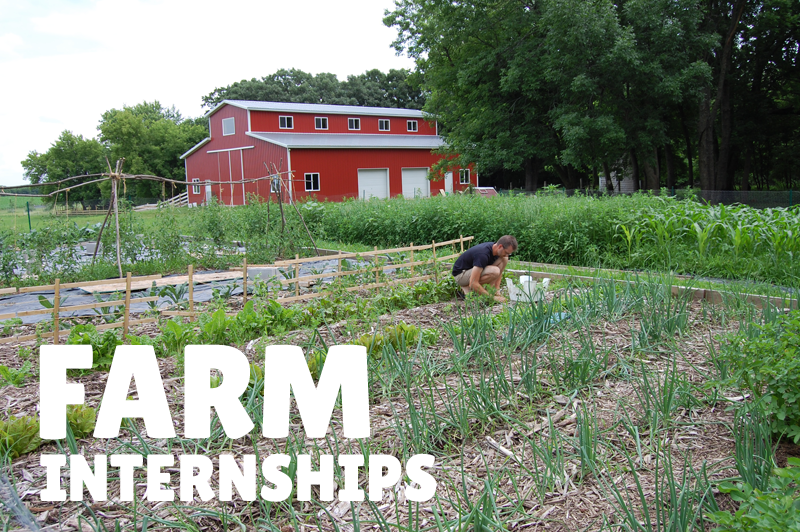 I am growing more convinced we were created to live on an agrarian calendar. Having annual traditions tied to the time of year always feels so, so right. 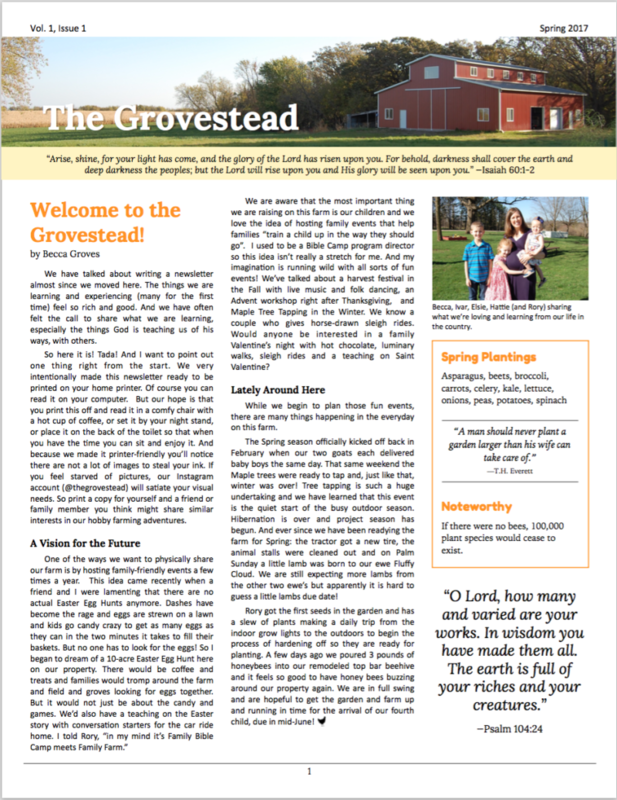 It was fun to be out and seizing the day, watching Rory putter with buckets and hoses and for all of us to be getting a little vitamin D. I believe spring fever has hit the grovestead. The trees are tapped and the sap is flowing. 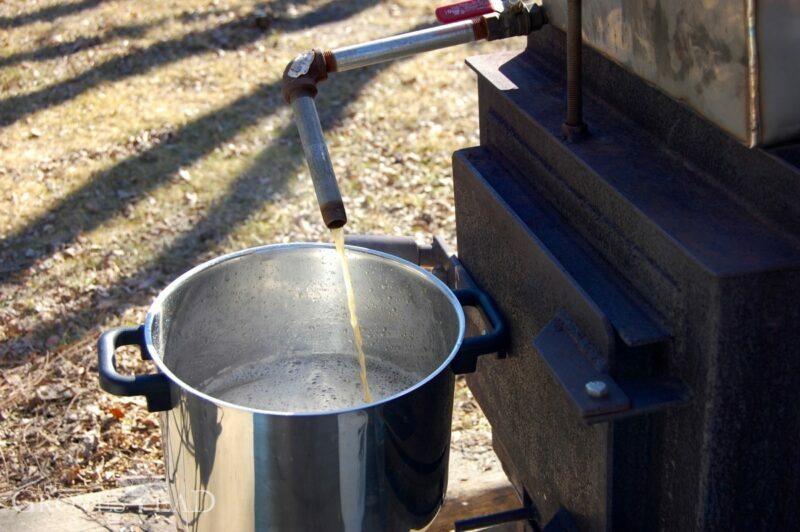 Finally its time to turn those gallons of sap into delicious maple syrup! If you have not already read part 1 and part 2 of this series you may want to go back and do that first. 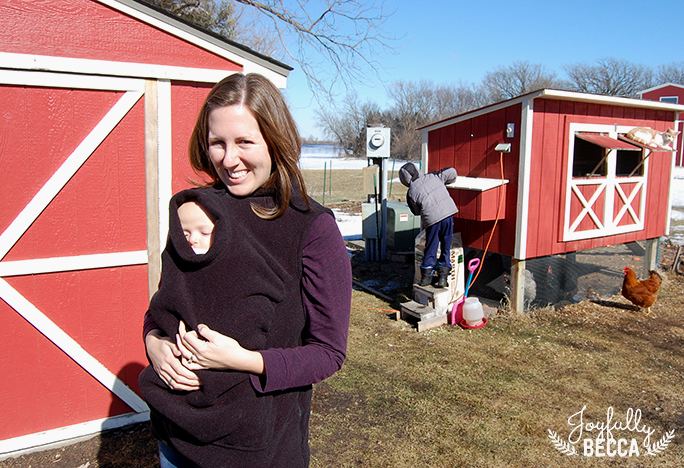 In this post I’ll cover the evaporating process and finishing and bottling maple syrup. 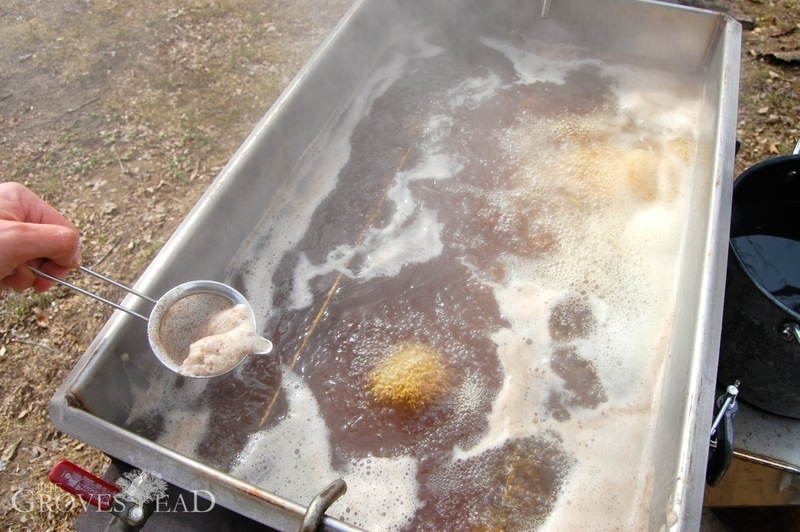 By far the most time intensive part of maple sugaring is the evaporating. Sap is 98% water, give or take, so depending on your setup you can spend many dozens of hours and an obscene amount of wood getting the sap boiled down to syrup. The last two years I hodgepodged together a cinder block evaporator. It worked, but was terribly inefficient and a bit dangerous. This year I had plans to build my own steel box evaporator and lucked out when a local welder offered to sell me his own at a great price. 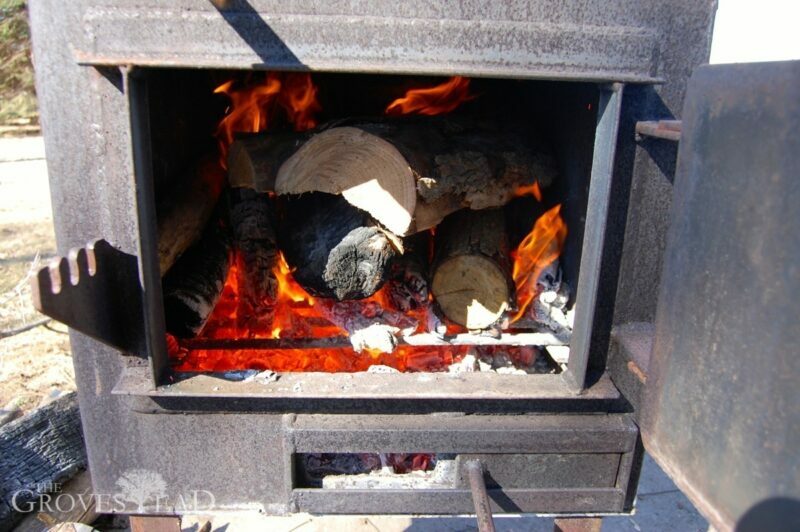 The firebox holds a tremendous amount of wood and the stainless steel pan can hold up to 15 gallons of sap at a time, although it is more efficient to boil a shallow than deep pan. The goal is to keep a roiling boil for hours on end. 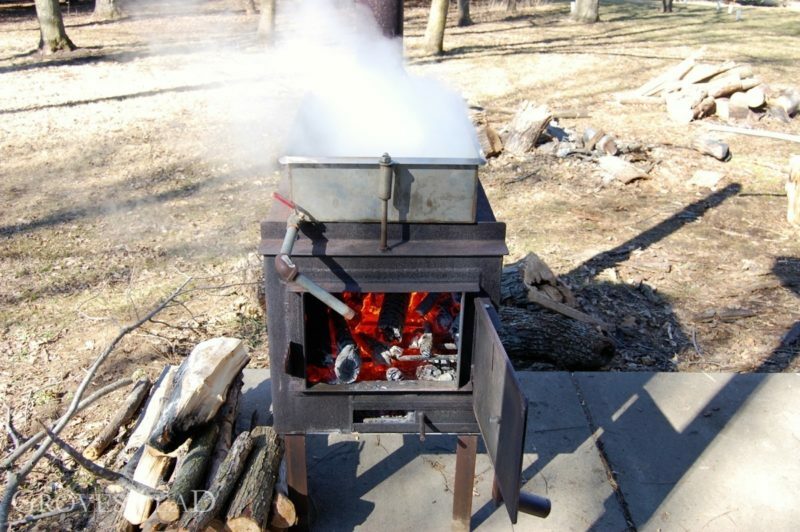 Because it takes so much wood and takes so long to get everything heated up, I usually wait until I have 20 gallons of sap collected before evaporating. The time required varies greatly by the weather. 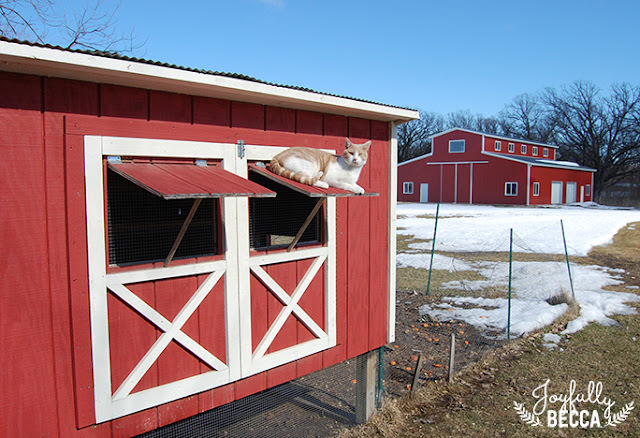 Colder, windy days take longer than calm, sunny ones. Next year I’ll make better use of firebrick and concrete blocks to insulate the steel from the wind and focus as much heat as possible to the bottom of the pan. While the sap is boiling I have a second pan warming sap on the edge of the evaporator. 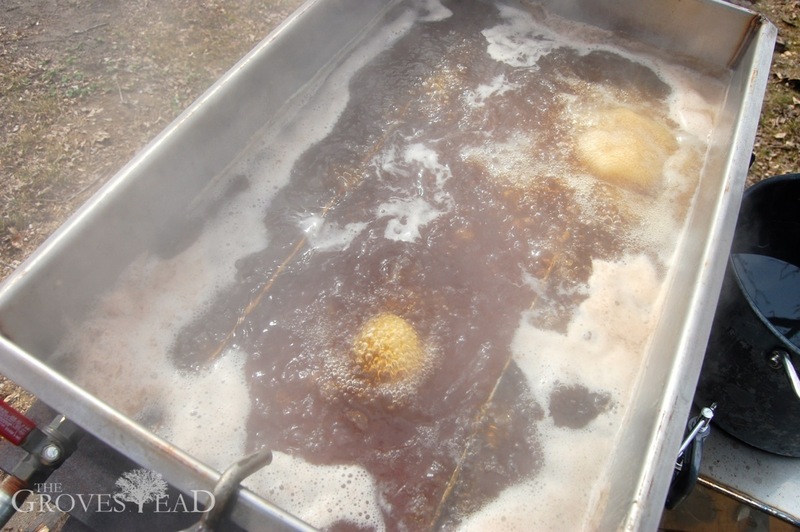 Pouring cold sap into a boiling pan would kill the boil and slow down the evaporating. So everything you can do to pre-heat the sap saves time in the end. As the sap boils impurities foam up to the surface. Every so often I use a strainer to scoop off the foam. That’s pretty much all there is to it. Feed the fire, add sap, strain. Repeat. 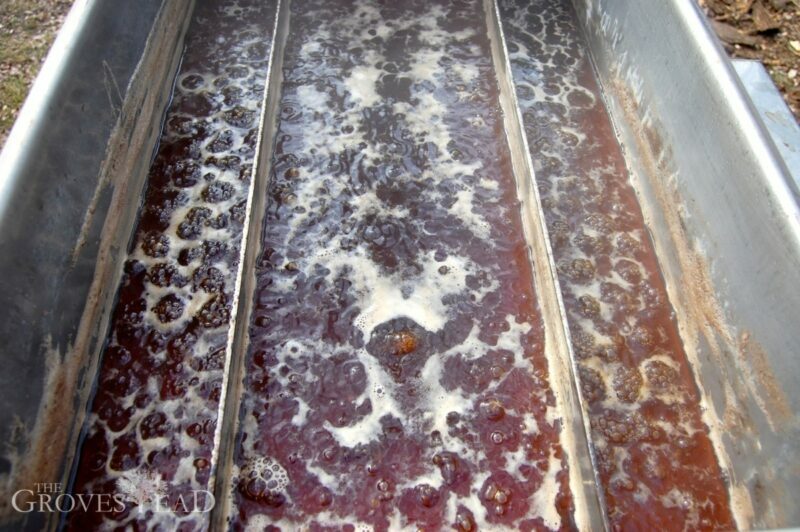 The evaporating is done when the sap is reduced to a dark brown color and the sap/syrup is thickening. It’s usually pretty obvious when the consistency of the sap has changed. Because the final stages of evaporating need to be tightly controlled, most people will “finish” the sap indoors on a standard range. My new evaporator has a nifty drain spout. To get the sap/syrup out all I need to do is turn the spigot. 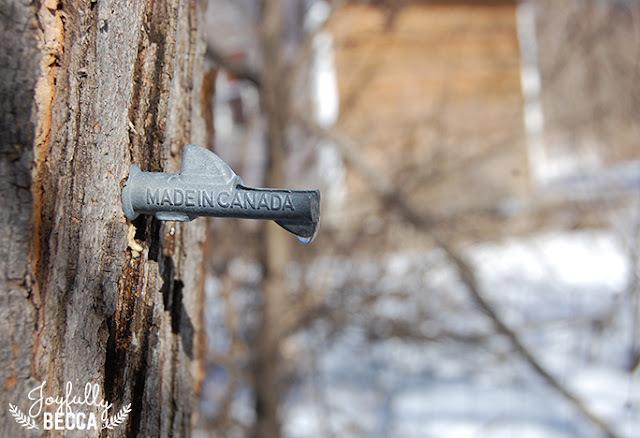 The final stage of making maple syrup involves getting the syrup to the right consistency. There are a couple of ways to do this. 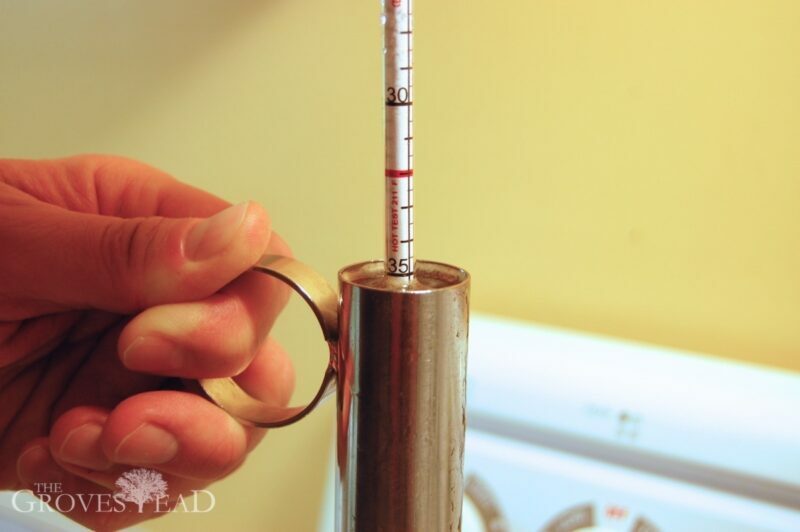 You can either measure the buoyancy with a hydrometer or use a candy thermometer to measure the boiling temperature. 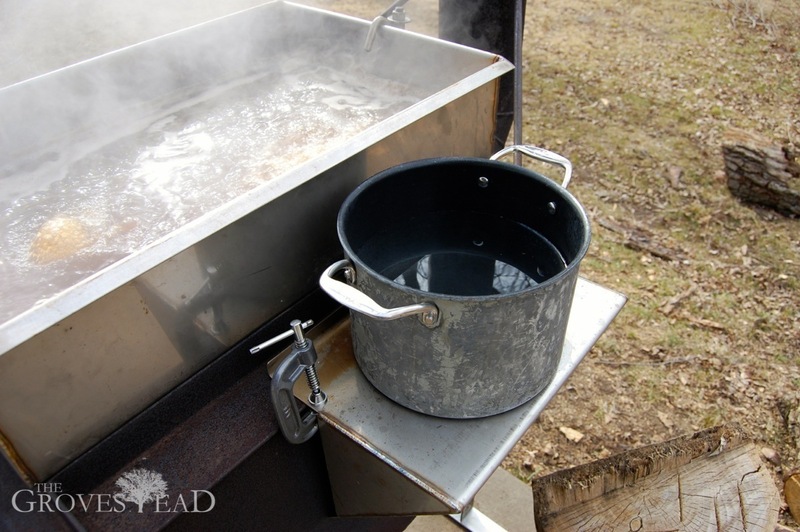 The boiling pot has to be watched closely because once the sap turns to syrup it can boil over quickly. I lose lots of syrup this way every year, despite my best efforts. 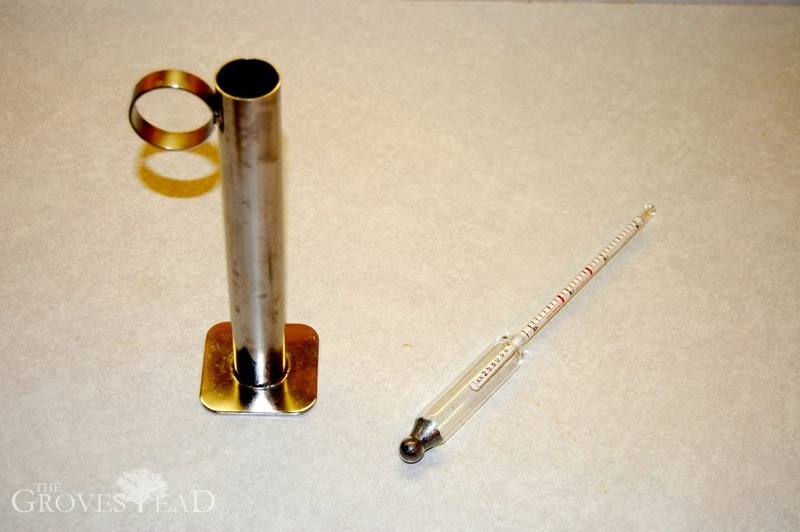 I like to boil at a medium-high heat taking periodic measurements with the hydrometer. After ladling syrup into the cylinder container, I drop the hydrometer in and it floats to the measured density. 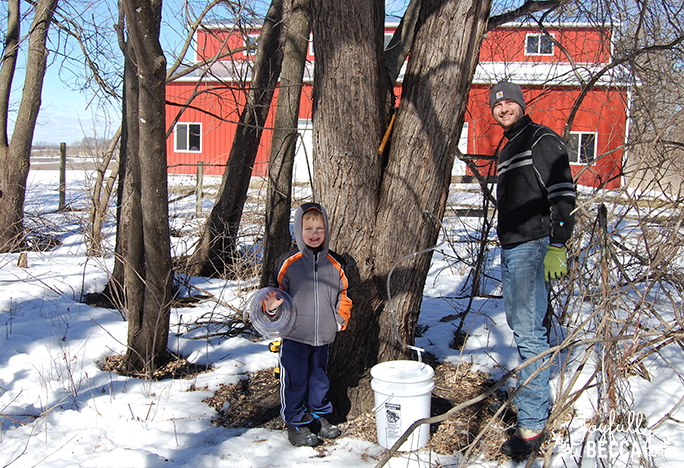 A reading of 32 Baume (or 66 Brix)—the red line—means the syrup is done. 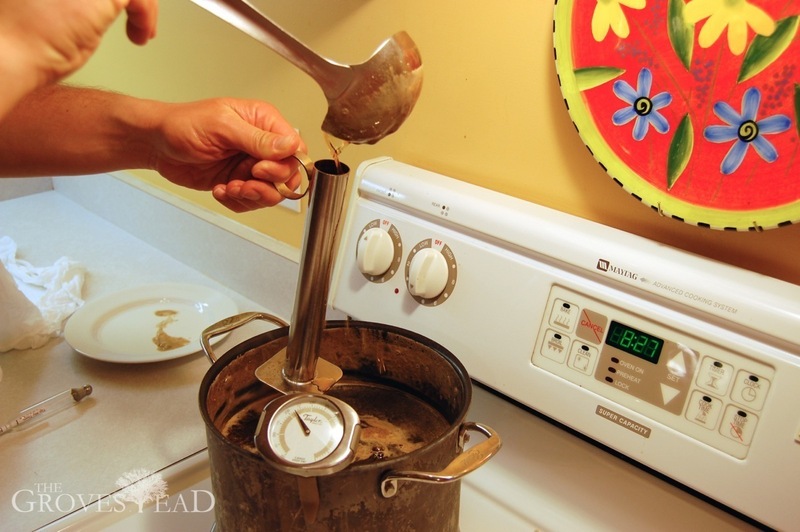 Alternately, a candy thermometer reading of 7.1 degrees above the boiling point of water (219.1 for most of us) is considered finished syrup. It’s important that the measurements be accurate, otherwise the syrup may be too weak and not store well or be too dense and crystalize. That’s why finishing inside on a controlled stovetop is preferred. Now the syrup is complete and ready to bottle. First the syrup needs to be filtered. 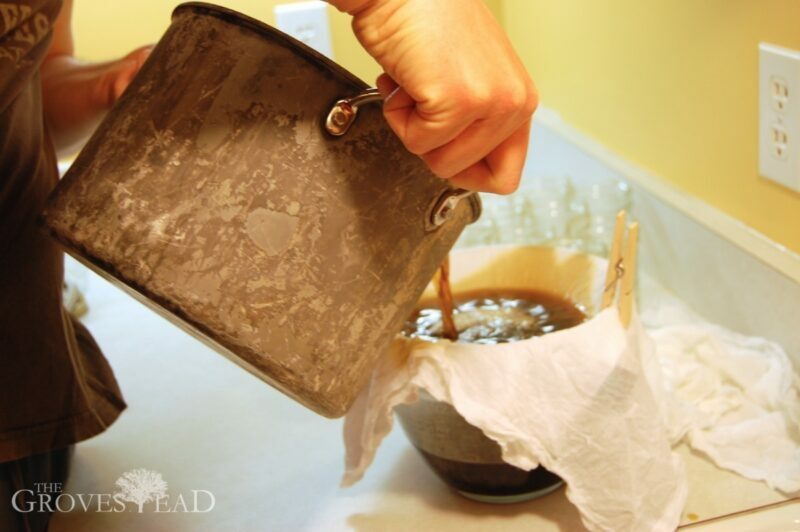 Some people use cheesecloth, but I prefer a dish towel folded in half (used only for maple syrup). In my experience cheesecloth is too porous and allows too many particulates through. I can usually filter 2-3 pints at a time into a 2-quart bowl. Then I pour into pre-sterlized canning jars and screw on the lids. 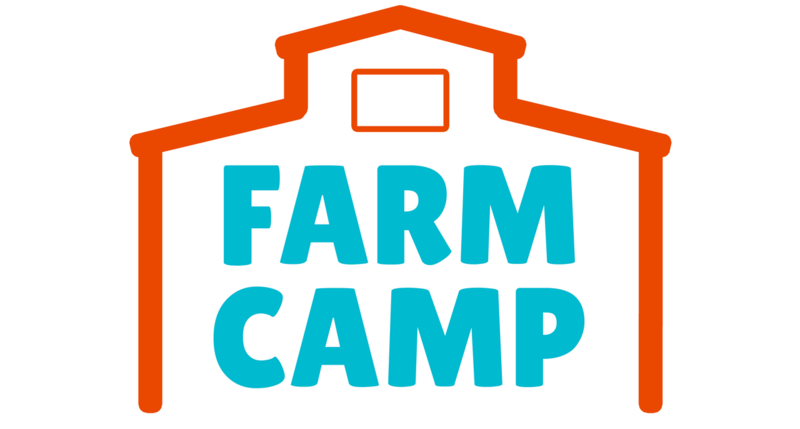 Syrup does not need to be sterilized in a water bath like other canning products. 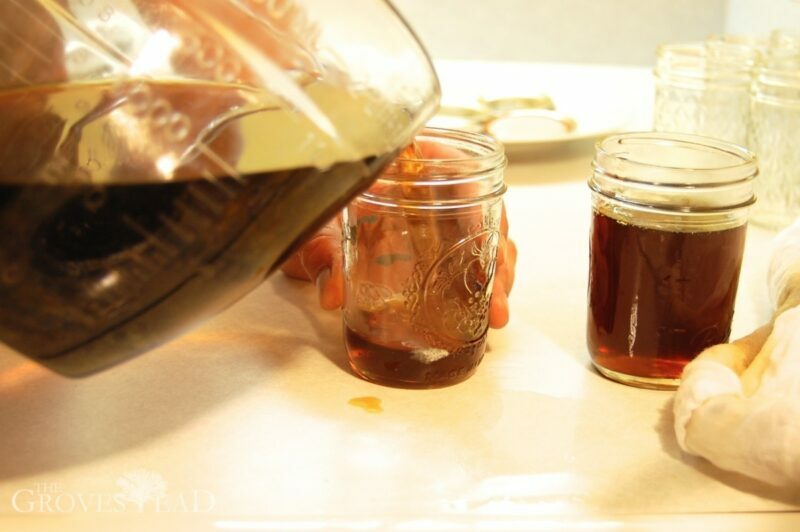 As long as the containers are sterile the boiled and filtered syrup will remain extremely hot for a very long time and create a tight seal as they cool down. Tip: screw the lids down as tight as possible, then the next morning screw them a little tighter, if you can. I’ve had some jars lose their seal days or weeks later, presumably because the lids were not as tight after everything cooled down. When you do open a sealed jar, it has to stay in the refrigerator from that point on. Pure maple syrup is different from the brown-dyed corn syrup you find in the grocery store and will spoil if not refrigerated after opening. 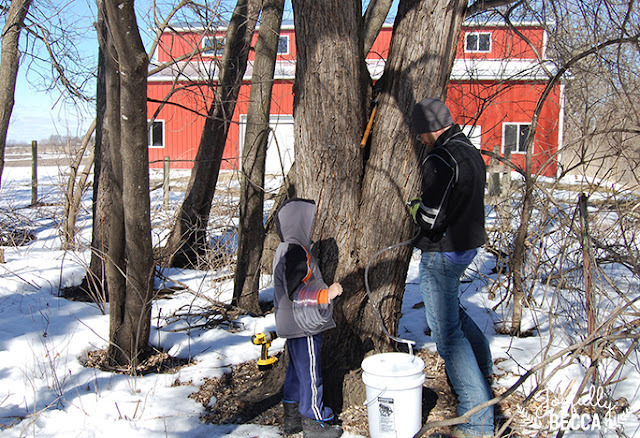 Properly sealed syrup will last at least one year, but likely won’t make it that long once you have a taste for it. 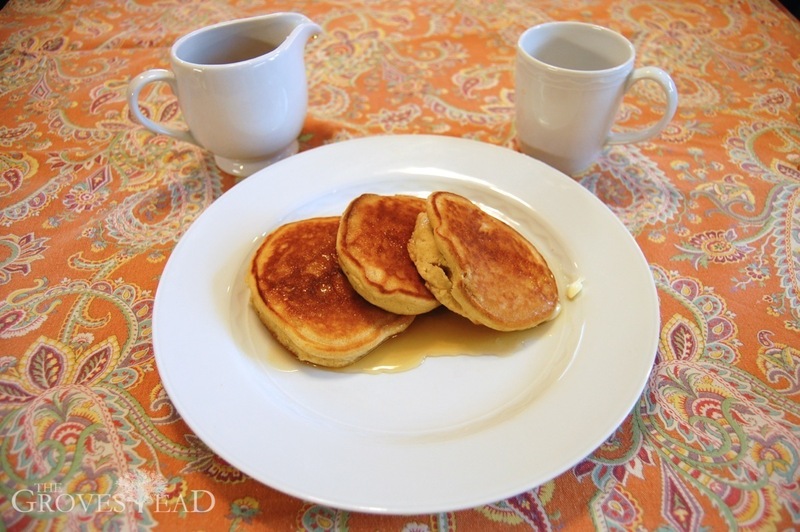 Last step: cook up some pancakes and enjoy.